Your sports news domain. Sometimes we do cover sundry Breaking News. Nigeria becomes the first African country to qualify for 2018 World Cup…. 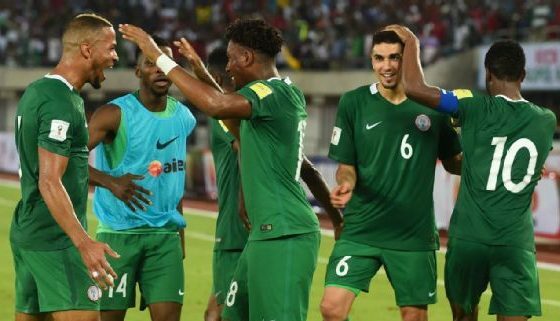 Arsenal’s Alex Iwobi scored as Nigeria beat a stubborn Zambia 1-0 to become the first African side to seal a place at next year’s World Cup in Russia. The win put them on an unassailable 13 points at the top of Group B. Chances were missed at both ends by the time Shehu Abdullahi provided the cut-back for Iwobi to finish from inside the box in the 73rd minute. Odion Ighalo, John Mikel Obi, Victor Moses and Moses Simon went close for the Super Eagles but failed to score. Zambia goalkeeper Kennedy Mwenne produced an acrobatic save to deny Wilfred Ndidi in the second half in a pulsating end-to-end encounter. Augustine Mulenga thought he had put Zambia ahead in the 22nd minute, but his effort was ruled out for offside. Fashion Sakala, Alex Ng’onga and Enock Mwepu had chances for the Chipolopolo but the 2012 African Champions failed to punish a perplexed Super Eagles defence. But substitute Iwobi, who had scored in the reverse fixture in Ndola last October, finished off a decent attack to send Nigeria to a third straight World Cup appearance. Moses had a great opportunity to add a second towards the end, but the Chelsea wing-back slipped inside the box. Nigeria stay top in Group B and advance with one game to spare from a pool that was dubbed the “Group of Death” and expected to go down to the wire. Russia will be Nigeria’s sixth appearance at the World Cup. They reached the second round in 1994, 1998 and 2014, but exited the tournament in the group stage in 2002 and 2010. ← Iniesta signs ‘lifetime contract’ with Barcelona….